On our trip to Japan, we based ourselves in 3 cities: Osaka, Kyoto and Tokyo. From these places, we made a few day trips to interesting smaller towns, such as Ise, Higashimurayama-shi, Himeji, Nikko and so on. This format was good, as it gave us our evenings free to explore our surroundings in the big cities. Big city Japan tends to be more fun at night. Osaka is a port city, and is the densely populated, bustling capital of the Kansai region. There are quite a few tourist attractions within the city itself, but I think that the main reason to visit Osaka is simply to visit Osaka. A day spent walking around the city and soaking up the atmosphere can be just as rewarding as a visit to Osaka Castle. 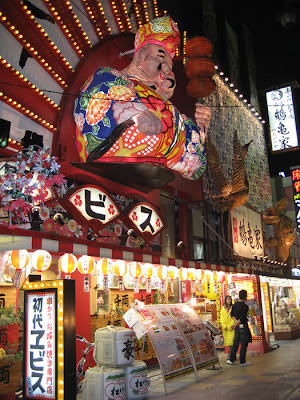 As you may have guessed, Osaka is a great place for food lovers. There are hundreds of eating and drinking places dotted throughout the city, just waiting for you to discover them. 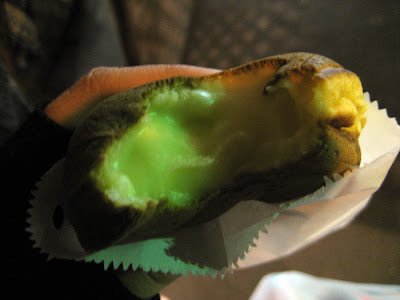 Osaka is home to many of Japan's most delicious treats, including takoyaki (octopus balls), kushi-katsu (a separate post to come, trust me, it's that good), okonomiyaki (cabbage pancakes) and more! No need for me to recommend individual places; just follow your nose. 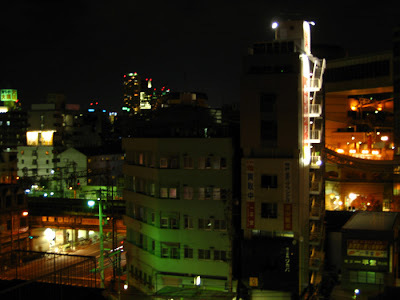 The 2 photos above are from the shin-sekai area, near our hotel. The name, ironically, means 'New World'. It doesn't look like it's been new for a good 30 years now, but it is fun. 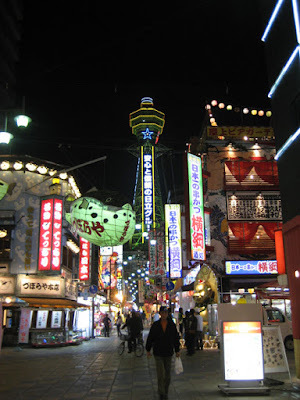 Shin-sekai features many restaurants, shops, and other entertainment businesses. Even better, the tight clustering of restaurants makes the whole area smell delicious, letting you know that a good meal is just a step away. View from our hotel. The working class Japan of my imagination. 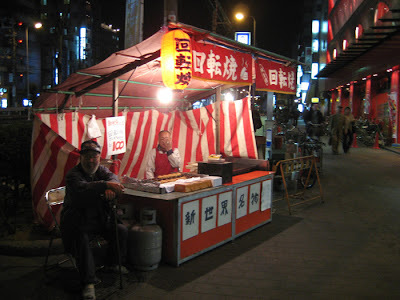 One of our favourite Osaka street treats came from this stall, on the main road between our hotel and shin-sekai. 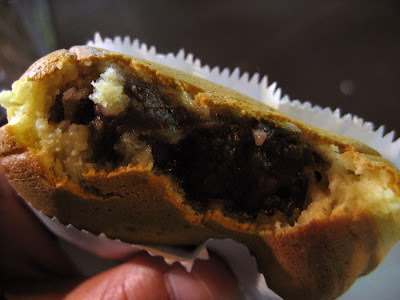 This dude makes kaitenyaki - crispy and doughy pancakes filled with red bean or custard cream. 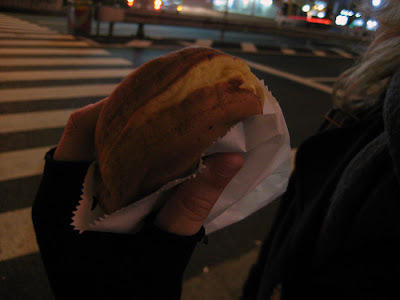 I have to admit that his equipment looked slightly grotty, but these $1 pancake pockets were some of the best things we ate on our whole trip. Something warm and sweet to fuel the cold walk home. Osaka looks fantastic! Coincidentally, Tony Bourdain just had a show there and said that the Osakans (is that right?) would spend their last money on food, whereas the Tokyo and Kyoto residents would probably buy shoes or clothes.